As the title suggests this isn't a direct Elton edition. The indirectness though has many links back to base, one of the strongest links in fact. Whenever there's a meeting of musical minds it's either a melding of both or a meddling in the other sides head. This one definitely melds, hopefully over the next few paragraphs we'll see the the separations and ultimately the unification of these diverse sides. The Royal Philharmonic Orchestra around this time was quite involved in the hook up of contemporary and classical. The Concerto For Group And Orchestra with Deep Purple (1969) not only being one of the first examples but one of the very best. It was a landmark piece and is one of my all time favourites. It's live setting and the first time run through can never be captured. The RPO backed Elton a few years later, some info on that here. Whatever the reports back from both events as to the RPO's attitude there's no doubting they mustered strong arms and lips for their escapades. But it's the main act that'll gain our attention first. For the first section I'll give a brief reportage of what's in it. The date, June 1971. The place, The Royal Albert Hall, London. A grand venue with no time for grand entrances, the show gets under way with a quick fire Parliament Hill. Sea And Sand is a beautiful relaxing piece that welcomes an exotic visitor in the form of Davey on sitar. It's a fine example of their melodic, lyrical observant outlook on life. 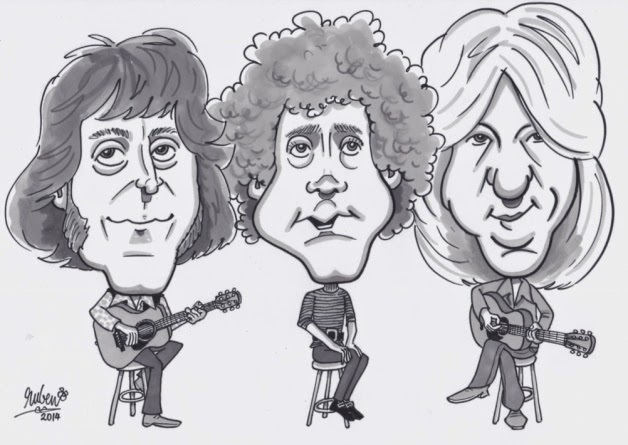 The Boatman written by Davey and featuring him on shared lead vocals is a more pared down version than later appeared on his Smiling Face (1973) album. Davey wasn't finished yet with showing off, his next input was spellbinding. Positioning the banjo and taking aim he fired off a relentless stream of licks on The Mason's Apron. The tension built up in the Hall as he captured the audiences attention in a full throttled grip. If it were a proper session they have been tempted to put their pints down for fear of spillages! It's a breathtaking example of virtuosity that Davey (luckily for us) never lost sight of. Chris may have suggested (jokingly!) Bert Weedon being responsible for that out pouring, but as we all know Davey channeled his inner Barney McKenna into an outward musical statement. 7 O' Clock Hymn has some incredible acoustic licks from Davey, thrown in as terrific foils. Chris's bluesy at times vocal really works well here. But Davey was going through the full box of tricks tonight. One act of genius with slight of hand was the revealing sound of electric guitar taking over his acoustic strides. A silky bubbly outro from him being pure magic. Old John Parker brings the 'solo' set to a close, with an intro that leads everyone astray to the songs ultimate direction. I'll not ruin it's surprise! Some neat inputs from Davey on mandolin here, not the last of the night from him on that instrument. All that gives way to what is the main reason why this disc works. The opening half is an incredible showcase of English folk starting with it's medieval pedigree and working right up to date combined with Davey's Irish folk ideology. It's a heady combo, maybe not unique in concept but very original in delivery. As is Season's. The title track of the 1970 album is essentially one side of the album. Which fits neatly into the prog rock category. But there's no categorisation here. 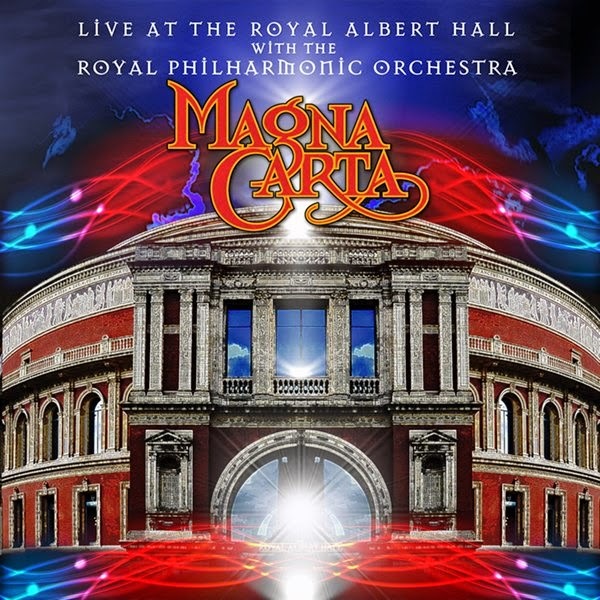 Because once Magna Carta and the RPO meet and greet they indulge in some wonderful chat. The man holding all this together is Johnny Dankworth. Known the world over for his jazz output, his background was more than that. The story goes he had heard the track and something inside him spoke and said there's an even greater thing to be extracted from it. And pulled it out of the hat he did, magic again no doubt. I'm going to try and encapsulate this wonderful section into something digestible, it's over half an hour long and is quite terrific. The orchestral intro cascades, full of characters and moods. It melodically builds up to the main theme, some great brassy shouts herald the rhythm section that has also joined in. It beats alongside unseen opening credits until the pace slows, they retreat and the band emerge. Some exquisite strumming from Davey holds court here, with swift lead from Chris until they both meet up and harmonise. Strong strings and woodwinds positioned for maximum effect. Glen really shines throughout here. Whether it be called spoken lyric or sung poetry, the end result is the same no matter what it's description. His strong diction on both styles that narrates the story that veers from word heavy to hanging phrases never fails. The pilgrim metaphor of life's journey is given a persona and soul by him. The orchestral transitions of the seasons are beautiful pieces. This is where the extra time is most welcome. The main body of the piece still has that laid bare feel, the orchestra merely reflects the musical message. Dankworth's love of jazz manifests itself in the form of a bass solo that is swept along by flips and cymbal rolls on the drums occasionally interrupted by broken rhythms. Davey reacquaints us with the electric guitar again, with dreamy strings hovering overhead. Spring has sprung and the step of all on stage is equally full of pep. The most enjoyable season is summer...Summer in Seasons being equally glorious and sunny. The transition from spoken to sung carefully guided by meaty, heavy strings. Stylish increases in pace are superbly travelled. Uptempo playing and singing by the three singers are cleverly separate but joined cleanly at the same time. Chris and Stuart's wildly differing vocal styles harmonise bang on the money. Nothing is out of step. The percussion section ably supported by the brass section duels with the entire group. No winners in the the duel but interplay being declared winner alright. ...but the ghost has reappeared after being over 40 years in the dark. The light of this incredibly unique venture has been resurrected in it's glory. Recorded with impeccable balance, the opening numbers are an intimate experience that dispels the notion of being in a vast emporium. When the orchestra arrives the roof seems even lower. But the music gains extra strength to hoist it higher than it ever was. Magna Carta in their solo section conducted a first class entrance audition for anyone not familiar with their work. 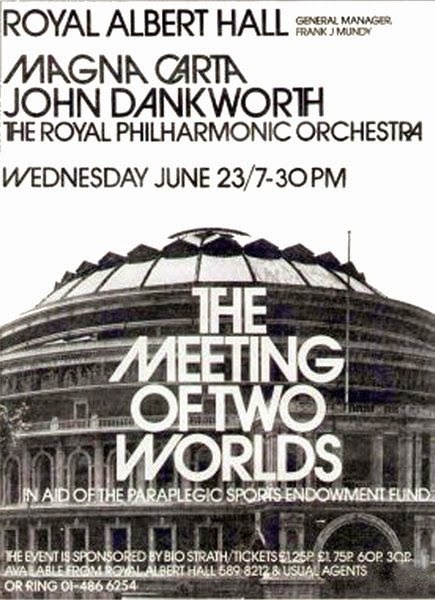 Johnny Dankworth conducted and arranged it with a sweeping vision of the grand and simple that Magna Carta had created. To paraphrase the introduction at the start, three brilliant young men were capable of delivering nothing less. Excellent. Appreciate all the history!